1 Hinduism is quite different from other world religions. For example, if you were a Muslim, you would read the Koran. If you were a Christian, you would read the Bible. However, if you were a Hindu, you would read a variety of ancient texts. While other major religions have a founding father or prophet, Hinduism has no original teacher. Hinduism is a unique religion in many ways. 2 Hinduism is over three thousand years old. The word "hindu" comes from Hind, which is a Persian word for India. Indians call their religion the Sanatan Dharma, which means "Universal Religion." In the broadest sense, Hinduism is the religion of the many peoples of India. 3 The country of India has many different regions, and Hinduism is not the same in each region. However, all Hindus love their sacred scriptures. The Rig-Veda is the oldest of the Hindu scriptures. In one part of this legend, a dragon named Vritra steals all of the water on earth. A god named Indra heroically fights the dragon to get the water back, and when he does, life is restored to the land. This story was first told orally. Later, Indians wrote them down in Sanskrit around 1500 B.C. Other Hindu scriptures include the Ramayana, the Upanishads, and the Mahabharata. These texts contain the core beliefs of Hinduism. 4 One central belief in Hinduism is a belief in Brahman, the universal spirit behind everything. He is the force behind all other deities. Brahman shows himself through many gods and goddesses. Every Hindu has his or her favorite god or goddess, and many temples dot the landscapes of India. There are also stunning statues of the Hindu deities in every home. This idea of a host of deities representing different aspects of Brahman is quite different from the Jewish, Christian, or Muslim idea of one god. 5 Some of the most dramatic statues represent the Hindu trinity. Brahma, Vishnu, and Shiva are the three parts of the Trimurti, or holy trinity. Brahma's job was to create the universe. He is different than Brahman, the universal spirit. 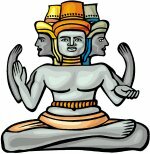 Representations of Brahma sometimes show three heads so that he can keep an eye (or six of them) on his creation! After he made the world, he was done with his job. 6 However, the other two parts of the Hindu trinity have ongoing work like the rest of us. Shiva's job is to destroy one cycle of life so that a new cycle can begin. One common statue of Shiva shows him dancing with a circle of flames surrounding his head. He is balancing on his right foot, while lifting up his left foot. His right foot rests on top of the Black Dwarf, a demon of ignorance. Shiva has four arms and wild, whirling hair! Flowers, snakes, and even a skull are held in his wavy locks. The symbols in this statue come from an ancient legend where Shiva conquered 10,000 non-believers by stomping on the demon of ignorance. Many Hindus love Shiva's fierceness! 7 Another part of the Hindu trinity is Vishnu. He has the 24/7 job of keeping order in the universe, which is probably a bit harder than keeping your room clean! Some of the liveliest stories in the Hindu tradition are about the avatars of Vishnu who came down to earth. An avatar is an incarnation of a god. Each of the ten avatars of Vishnu came to rescue earth from trouble. The first avatar came as a fish to rescue the world from a flood. Another avatar was a warrior named Parashurama. He wiped out a bad king. One of the liveliest avatars of Vishnu was Krishna. He was avatar number eight. He had the blue skin and was a butter-loving, flute-playing cowherd. Krishna has unofficially won the most popular avatar award in Hinduism! 8 One of the reasons that Indians love Krishna is because he is the central character in an enormous poem called the Mahabharata. One important part of this poem is called the Bhagavad-Gita, which tells the story of a war between relatives. One family represents good, while the other family represents evil. Arjuna is the leader of the good side, and Krishna is his charioteer. Together they wage an exciting war against darkness! Feedback on What is Hinduism?